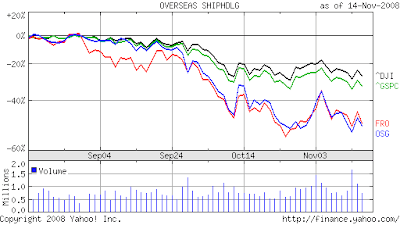 Frontline (FRO) and Overseas Shipholding (OSG) are each down almost 50% since I looked at them in August. Now that their share prices have come down significantly, they are worth another look. While the broader market has tumbled as well since August, Frontline and OSG have significantly underperformed. I wrote in August, that "tanker oversupply may lead to a fall in spot rates, even if demand for oil remains constant." This remains my view, but add to it a drop in oil demand and oil production. It looks like investors are anticipating something like this, for earnings at the shippers so far have been improving. OSG, for instance, reported an increase in earnings in the most recent quarter, primarily on higher day rates for its VLCCs (Very Large Crude Carriers). FRO is scheduled to report next week, and I will be surprised if its earnings disappoint. As far as estimates for tanker supply go, the consensus is that over the next few years it will grow by 4 to 5% annually. Historically, tanker demand has grown less than 2% per year. Given the worldwide recession and OPEC's production cuts, there will probably be less oil to transport in the next year, if not for a longer period. (OSG's management thinks the next good year will be 2010.) With more ships ready to transport that oil, it is hard to see how day rates will not decline, at least in the near term. This means lower earnings for both FRO and OSG, and probably substantially smaller dividends for FRO's shareholders. The tanker supply glut may not be as bad as expected, however. Many new ship orders may be canceled due to the credit crisis. OSG's management estimates that almost a third of all orders will be canceled. This is potentially good news for day rates. It is not good, however, for those tanker companies that will lose their deposits when they cancel. Looking at Frontline's upcoming report will tell us whether it will be one of the companies forced to cancel. OSG should do fine, and may have the opportunity to take advantage of its struggling peers. Near $30 a share, FRO is starting to look very tempting. Its long term shareholders say that the shares have paid for themselves. Indeed. Back in August 2001, FRO traded under $14 a share. While its share price has more than doubled since then (which is very good, especially considering that the S&P 500 and DJIA have negative returns for the same period), FRO has paid out over $69 per share in dividends. That's one of the reasons I put it in my model dividend stock portfolio. Depending on the coming earnings report, and if the stock stays under $30, I'll be looking to start building a position in FRO. OSG, with its cleaner balance sheet, also looks tempting. I wrote in August that I might buy a speculative stake at $50 per share. I'm glad I didn't. While the dividends are more stable than FRO's and the yield is now a nice 5%, if all goes well FRO will probably outperform on that front. While increasing its dividend recently, OSG seems to prefer to use its spare cash on share repurchases. It has wasted millions buying its shares for an average price over $70. Using that money to repay debt, or giving it to shareholders would probably have been better. For a cleaner balance sheet and a potentially higher dividend (probably between 8 and 10% next year), one might consider Nordic American (NAT). The company seems to be a great play on China's future growth. It also has no debt and relatively lower costs (in some cases substantially lower) than its competitors. NAT's small fleet is composed solely of Suezmax tankers. Last quarter, it cost around $9,000 a day to run the fleet. The company recorded average day rates of almost $64,000. While costs may rise and day rates will likely fall, NAT seems best positioned to whether the recession and take advantage of any struggling competitors by buying up their assets for cents on the dollar. Yet, I am wary of buying NAT--for the silliest of reasons. It seems Jim Cramer has been talking up the stock, and even had its CEO on his show. I try to avoid buying what Cramer recommends, especially when it seems like a no brainer. 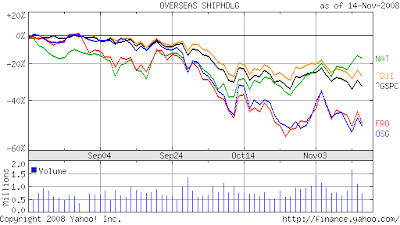 So far NAT, while down, has outperformed the market and the other two oil shipping stocks mentioned. I don't see why it can't continue to do so. If so, I won't be along for the ride. If NAT falls to $15, I might consider it for my portfolio. Disclosure: At the time of writing, I had no positions in the above mentioned securities. You Don't Know Whether Buffett Lost His Touch! What's the Point of Share Buybacks?